Whether you're opening your first restaurant or are looking to replace the old tables in your bar, we've got the perfect product for you. With the Lancaster Table & Seating 22" x 22" black 3" bar height column table base, you can create a comfortable dining area for customers in your establishment! A heavy duty, cast iron, cross shaped base offers durability and stability to your table. It includes (4) FLAT Tech Equalizer table levelers. These levelers help keep tables secure and balanced when placed onto irregular or uneven floors. They can accommodate up to a 1/4" variance in the level of floors and lock into place for superior stabilization. They are also helpful in cases where you wish to align multiple tables together, by eliminating any height gap from one table to the next. All of these elements combine for less customer complaints and accidental spills caused by a wobbly table. Plus, the included chrome foot ring lets your customers rest their feet, as opposed to dangling them, for a more comfortable dining experience. 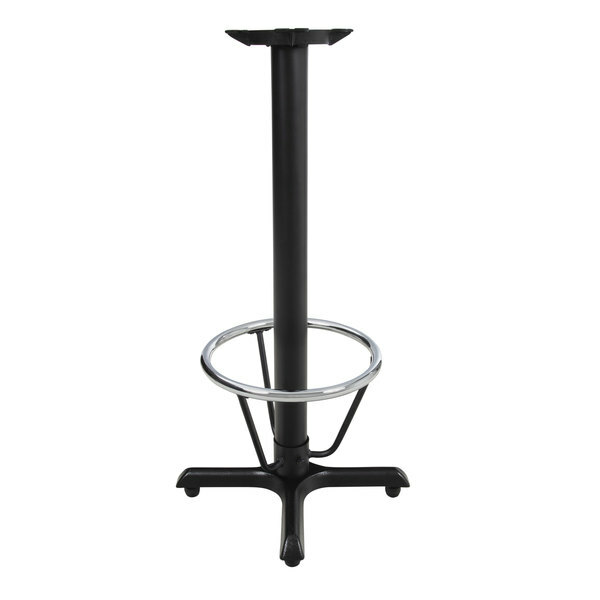 The base column is made of durable steel to support the heavy weight of table tops and their contents. It measures at 3" in diameter with a threaded interior rod that easily affixes to the spider plate. The spider is made of a heavy cast iron with 8 pre-drilled holes for the included pan head screws to secure the column to the tabletop. This base is able to hold up to a 30" round or square tabletop by itself, without the support of additional bases. It is finished with an attractive black powder coat for a sleek, professional appearance.